The San Francisco 49ers were cruising along at 8-2 as they hosted the rival Los Angeles Rams on November 20, 1994. Head Coach George Seifert’s team had an outstanding offense built around the nucleus of QB Steve Young, WR Jerry Rice (pictured at right), and RB Ricky Watters, and there were plenty of other fine players around them. The defense benefited from the addition of CB Deion Sanders and was anchored by young DTs Dana Stubblefield and Bryant Young. The Rams, coached by Chuck Knox, were struggling at 4-6 and had been beaten handily by the 49ers at home earlier in the season. QB Chris Miller was talented but injury prone and RB Jerome Bettis was having difficulty duplicating his first-year exploits, although rookie WR Isaac Bruce was showing promise. There were 62,774 fans in attendance for the Sunday night game at Candlestick Park. The 49ers took the opening kickoff and drove 72 yards in eight plays. Steve Young completed five passes, three of them to Jerry Rice and the last to WR John Taylor for a seven-yard touchdown. Doug Brien added the extra point. The Rams responded with a seven-play drive of their own that covered 48 yards. Chris Miller was sacked by DT Bryant Young for a loss of eight yards on first down and had to leave the game, but backup QB Tommy Maddox completed passes to RB David Lang for ten yards and WR Todd Kinchen for 39 to the San Francisco 21. Los Angeles reached the 14 before the drive stalled and Tony Zendejas kicked a 31-yard field goal. San Francisco put together another methodical drive of 67 yards in 13 plays. Young completed five more passes, two of them to Ricky Watters and two to Rice, the second for a seven-yard TD. Brien converted and the Niners took a 14-3 lead into the second quarter. LA benefited from a roughing-the-passer penalty on Miller, who was back in the game, and two completions to Isaac Bruce picked up 18 yards to the San Francisco 10. Once again the Rams were unable to reach the end zone, but Zendejas added another field goal from 27 yards to narrow the home team’s lead to 14-6. The scoring parade finally ended as the teams exchanged punts. Starting from their own eight, the 49ers advanced 92 yards in 12 plays. Watters gained 22 yards on two carries to start, RB Dexter Carter ran twice more for 17 yards, and Young completed five passes and scrambled once for a first down. Rice again had two catches, and again the second was good for a touchdown, this time from six yards out. Brien added the PAT and the Niners took a 21-6 lead into halftime. The Rams took the second half kickoff and drove 70 yards in six plays, the biggest of which was an end-around in which Kinchen raced 44 yards for a TD. The try to pass for two points failed and the score stayed at 21-12. Once again the 49ers moved effectively down the field. Young had completions to Rice for 29 yards and Watters for 14, but this time they ended up with a field goal by Brien from 28 yards, still keeping them comfortably in the lead by 24-12. 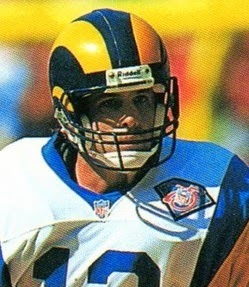 LA faced a third-and-12 situation on its next series but Miller completed a pass to Kinchen for the needed yards and, three plays later, the Rams pulled off another big play when Miller threw long down the left sideline for WR Willie “Flipper” Anderson, who beat Deion Sanders and went the distance for a 50-yard touchdown. Zendejas added the extra point and the visitors were now just five points behind at 24-19. On San Francisco’s second play after the ensuing kickoff, Young (pictured at left) went deep for Watters to pick up 35 yards and, adding on an unnecessary roughness penalty, the Niners advanced all the way to the LA 26. But the 49ers were able to gain only three more yards and Brien’s 41-yard field goal attempt was wide to the right. The Rams were on the move as the game headed into the fourth quarter. Miller completed passes to Anderson for 14 yards and Jerome Bettis for 20 to reach the San Francisco 36. Two runs by Bettis, plus a facemask penalty, picked up another 14 yards before Miller fired a pass toward the goal line that WR Jessie Hester caught for a 22-yard TD. Bettis successfully ran for a two-point conversion and the upset-minded Rams were ahead by 27-24. The 49ers again reached Los Angeles territory, but a penalty for an illegal forward pass by Young, who was a yard past the line of scrimmage on what would have been a long completion to TE Brent Jones, forced them to punt. The Rams went three-and-out and had to punt in turn and the 49ers, starting from their 43, advanced back into LA territory. But after a six-yard run by Watters gave the Niners a first down at the 25, Rice fumbled when hit by LB Shane Conlan after catching a pass and DE Gerald Robinson recovered for the Rams. LA again couldn’t move on offense and punted following a short series, and San Francisco responded with a 10-play, 67-yard drive. Young threw to Jones for 19 yards and to Rice for 14 yards in a third-and-six situation. The drive was capped by another Young pass to Rice that resulted in an 18-yard touchdown. Brien’s extra point put the 49ers back on top by four. The Rams regained possession with 1:56 remaining in regulation. Miller passed them to the San Francisco 38, but a holding penalty backed them up, Deion Sanders deflected a throw into the end zone that was intended for Anderson, and Lang dropped a fourth-down pass to seal the 31-27 win for the 49ers. San Francisco had significant edges in total yards (459 to 358) and first downs (32 to 17). They also recorded the game’s only two sacks, but also the only turnover and led in penalties (7 for 60 yards to five for 50). 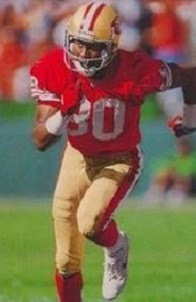 Jerry Rice set a then- club record with 16 catches, good for 165 yards and three TDs, and made up for his fourth quarter fumble with the game-winning reception. Steve Young completed 30 of 44 passes for 325 yards and four touchdowns with none intercepted and also ran for 23 yards on 10 carries. Ricky Watters gained 81 yards on 20 rushing attempts and added 74 more yards on five pass receptions. John Taylor also had five catches, for 49 yards and a score. For the Rams, Chris Miller (pictured above) was successful on 16 of 33 throws for 228 yards and two touchdowns, also with no interceptions. Willie Anderson caught five passes for 99 yards and a TD while Todd Kinchen contributed 51 yards on two receptions and had the one 44-yard scoring run, which made him the team’s leading rusher. Jerome Bettis was held to 29 yards on 15 attempts. San Francisco kept on winning, finishing atop the NFC West with a league-best 13-3 record and going on to thrash San Diego in the Super Bowl. The Rams didn’t win again the rest of the way, ending up at the bottom of the division with a 4-12 tally. It was the franchise’s last season in Los Angeles as it departed for St. Louis the following year. Jerry Rice led the NFL with 1499 yards on 112 catches that included 13 touchdowns. It marked his ninth consecutive season with over a thousand receiving yards and he was a consensus first-team All-NFL selection for the eighth time and a Pro Bowl selectee for the ninth straight year. 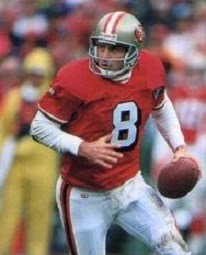 Steve Young led the league in passing with a 112.8 rating and in touchdown passes with 35. He received consensus league MVP honors in addition to being a first-team All-NFL choice for the third year in a row and a Pro Bowl selection.